My iPhone is my baby. I eat with it, sleep with it, play with it, rely on it. In fact, I do everything with my iPhone except bathe with it (and in that case its only a couple feet away). I love apps and I love discovering new apps that make me happy and organized. I was just introduced to the Mom's Summer Survival Guide app from Kohl's and boy am I glad. - Links to useful web sites to learn about places to go camping and hiking, theme parks in your area, and safety information. - Day-By-Day themes to make each day of summer something the kids will look forward to. - Back-To-School Tips and Organizer. The kids may not want to think about this one! But mom will be prepared with these useful tips. - Me Time. Mom, you’ve spent summer focusing on our family, now take a little time to de-stress and sneak in a few moments to concentrate on you. 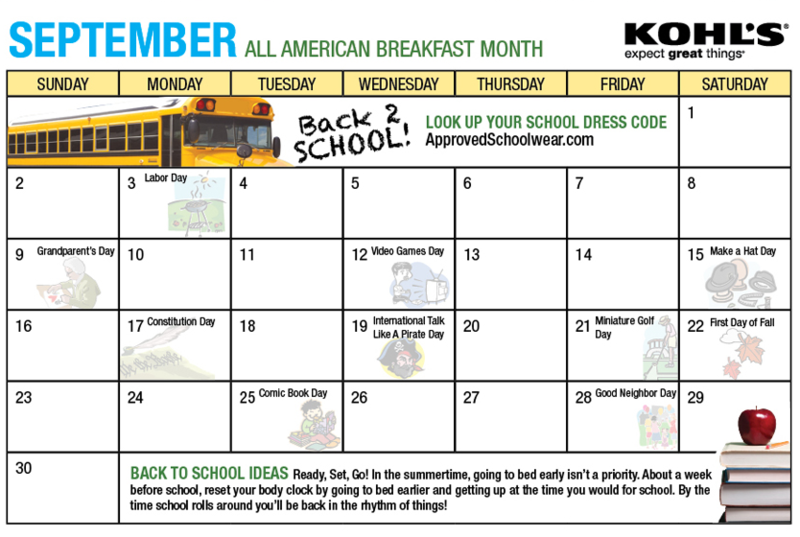 - Find your Back-2-School Styles with Kohl’s Approved Schoolwear along with a handy shopping list app to keep track of what you’ll need when it’s time to get back to school. Each one of the banners is clickable and it leads to a section of the app. 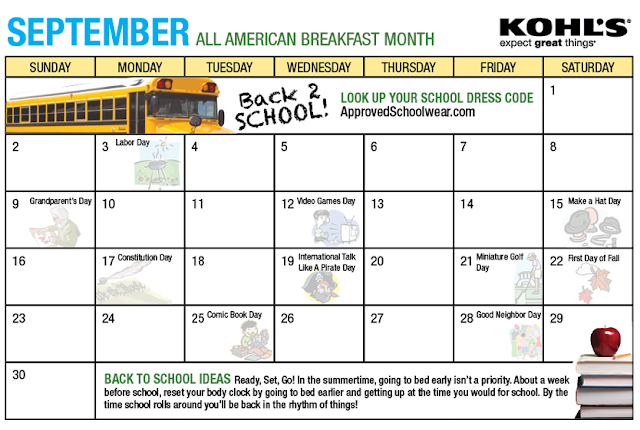 These sections include: Summer Tips, Calendar of Events, Back 2 School Shopping List and Shop @ Kohl's. That looks like a nice, printable calendar with all the important dates on it. You have no excuses now not to remember my FAVORITE holiday; International Talk Like a Pirate Day, now do ya Matey?! Apple Users click here to download this awesome Summer App. I would buy new sneakers for my son. My son could use some new pants for school. New long sleeve shirts for my grandson! I'd get tshirts for DDs. I will buy a purse. On some new jeans for hubby! Clothes for me or back to school clothes for the kids! I would get my son new school clothes. I'd hit the kids' clearance racks for my dd. I'd buy a pair of jeans for my son! thanks!! Back to school shoes for my daughter. I will use it to buy some new sheets and pillows. I would put it towards my son's winter coat. Thanks for the chance. I would buy some shoes for fall. Thanks! I would get some new work shoes! A new fall top for sure. I would spend it on some new clothes for work! I would get my daughter some jeans for school. I will buy a pair of new jeans. I would buy Carter some warm clothes for fall! He grew so much from last winter! I would use it for school uniforms. i would get new sheets! I'll spend it on new sneakers for myself! I would buy weight loss clothes!! Maybe I would buy something for myself for a change! New jeans without holes in the knees! I would spend it on clothes for me!! New shoes for my boys or new towels. i need new pants or jeans!